4 Things That Have Helped Me Chill Out. I’ve always been one to worry about stuff. Anything really. As a child I worried every Sunday night about returning to school the next day. Or that my parents were going to die soon. Always about things that might happen. As a new mommy I would lay in bed at night worry about all the awful things that could happen to my family. Always with the nervous belly. Always something to worry about. Over the last couple of years though, I’ve really worked hard at not worrying about so much stuff. Stressing less and letting things go. It’s not easy, btw, and something that I have to work on every single day. When I think back, there have been a few things that I’ve incorporated into my life that have helped me worry less and just chill out. Sharing these with you, in the hopes that maybe you can add similar things into your life. To worry less and live a more chilled life. A few years ago I started journaling, again. Growing up I always had a journal going. Yet somehow over the years I let the practice go. It’s how I start my days. And the best way (for me) to release anything in my head that I’m struggling with. There are no rules, no expectations. Whatever needs to come out on the page is free to flow. As part of my morning journaling, I write down 3 things am grateful for. This gratitude practice has become a non-negotiable in my life. And one that I encourage all my clients to incorporate. It not only helps me become aware of all the little (seemingly insignificant), daily joys that bring happiness to my heart, but it’s also been a great reminder of what is truly important in life. Walking my dogs. Every afternoon after lunch. It helps me shift from the morning spent with clients to an afternoon of kids and any online work I have. My mind quiets. I breathe fresh air. 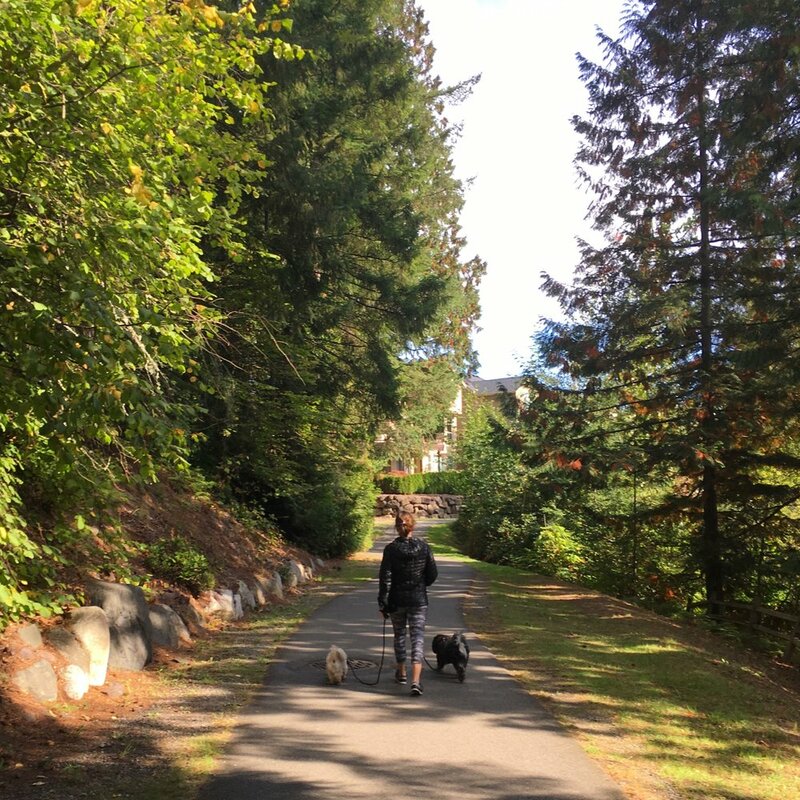 I slow down (mostly…even if the boys are pulling). It’s taught me the importance of a daily walk, especially for someone dealing with adrenal issues (more on that coming up). I cannot stress the importance of a daily leisure walk. Do it! Everyday! Being diagnosed with adrenal fatigue a few years ago gave me no choice but to chill out. The adrenal glands produce cortisol, a hormone that gives you energy and helps you cope with stress. Over time, the wear and tear of life including physical, mental and emotional stress can cause adrenals to become fatigued. Cortisol levels should be high in the morning and then gradually drop throughout the day. Mine followed this pattern, but my cortisol barely registered in the morning and just went down from there. My doctor was confused as to how I could even get up in the morning. I was tired, achey, and unmotivated. I was a personal trainer that didn’t feel like working out! Seriously. I was preaching to all my clients the importance of moving their bodies, yet I had no desire to move my own. I felt like a fraud. To be fair, I was exercising, it was just a struggle. I taught an indoor cycling class 3x/week and worked out with a trainer 1x/week for 60 minutes. During these sessions with the trainer, I pushed myself hard to make up for how little I was working out. I’d come home exhausted. Completely drained and starving. I literally wanted to alternate between stuffing my face and napping. I was also trying to grow my in person training business…so I was spending lots of time driving from client to client, both in the mornings and evenings. And being a mom, which is a full time job in itself. I was so tired and stressed out. Something needed to change as I didn’t know how much longer I was going to be able to sustain this pace. So I swapped the 60 minute training session for much shorter sessions (15-20mins). Stopped teaching indoor cycling. And added as much yoga, meditation, and recovery time I could. Truly believing that the Universe does indeed have my back. This might look more religious for you and that's totally cool. It's just about knowing, deep down, that you are supported and being looked after by some higher power. That the path you are taking, no matter how many side roads you travel, is the exact journey that you are meant to be on. Believing this, saying it over and over in my head and letting it flow on my journal pages has definitely helped me to worry less and chill out more.